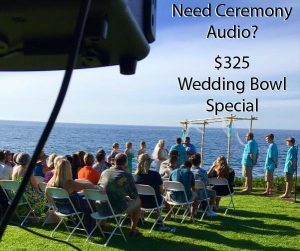 The Wedding Bowl at Cuvier Park is one of the most highly sought after San Diego Coastline Wedding venues. So much so, the City permit department is known to hold a lottery if more people apply for the same date. Site is permitted for weddings but not for receptions. Only one permit per day is issued for this site. Permits issued for wedding ceremonies are allotted up to four hours, including the set up and breakdown. Food/Beverages Receptions are not permitted at this site. No glass containers..
Restrooms There are no restrooms at this site.